The Tony, Grammy and Olivier Award winning hit musical, JERSEY BOYS just received a 2010 Helen Hayes Award nomination for Outstanding Non-Resident Production. The Helen Hayes Awards are Washington DC’s most prestigious theatre awards and a vibrant living legacy to The First Lady of the American Theatre. The Awards ceremony will take place April 5. The National tour of Jersey Boys played a successful run at the National Theatre in Washington, DC from October 2, 2009 through December 12, 2009. Jersey Boys will next play Memphis at the Orpheum Theatre from January 27 through February 14, 2010. Jersey Boys is the winner of the 2006 Best Musical Tony Award®, the 2006 Grammy Award for Best Musical Show Album and the 2009 Olivier Award for Best New Musical. 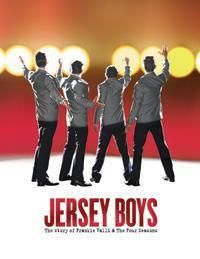 Jersey Boys opened at the August Wilson Theatre on Broadway to critical acclaim on November 6, 2005. The Jersey Boys National Tour opened to rave reviews in San Francisco on December 1, 2006, played a record-breaking run in Los Angeles and is still breaking house records in cities across North America. There are six Current Productions of Jersey Boys: New York, London, Las Vegas, Toronto, a US National tour, and Melbourne, Australia.